This map was produced for the ‘Reports of Superintending Inspectors of the General Board of Health. Highly recommended is a view on double magnification. 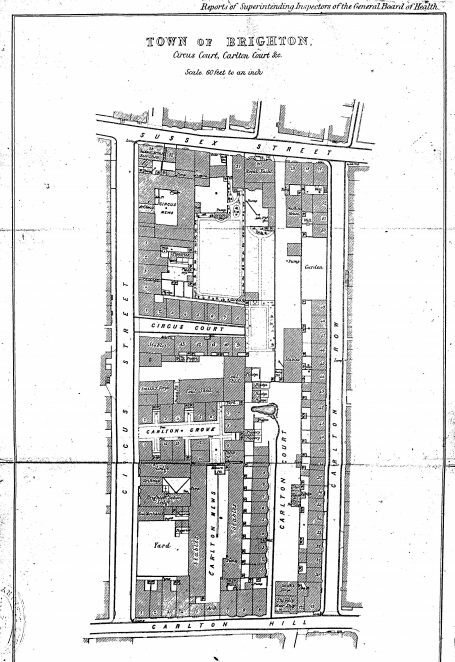 Firstly note that although a residential area, the accommodation not only had privies in the yards, it was also intermixed with numerous pig stys, stables, ash and dung pits, open gutters and an open cess pool. Then note in close proximity to many of these were the domestic wells which provided a source of drinking water. Cresy was using the map to show how too many houses had been crammed into a small space, the smell and air they breathed was foul, and that seepage of effluent from the pits was finding its way into the local supply of drinking water.